We will be happy to welcome you in our gites for your holidays. You'll love the peaceful atmosphere of the old stone buildings of our region. In the evenings, after the day spent discovering the multiple riches of the area, you can relax in the garden by drinking an aperitif, before making delicious grills on the barbecue. Our swimming pools are all provided with parasols and loungers, to make your stay a pleasant experience. Everything is reunited to make your stay an unforgettable moment in time. Blissfully peaceful, our gites are all you could dream of for an exceptional holiday in the Périgord. 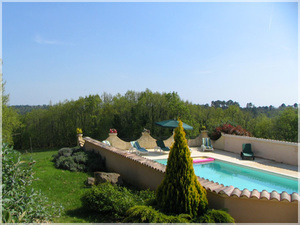 Les Peyrières is the ideal place to come to relax. The 3.7 acres of park will provide you with all the delights of the countryside. You may even have the luck to cook some cèpes collected from the borders of the forest which surround our holiday homes, and after a day of relaxation at the swimming pool, you'll be able to appreciate the charm of a good barbecue. These two gites have heating. Les Peyrières is only 12 km from the market town of Le Bugue on the Vèzere river, which has many sites to visit and is the crossroads to numerous other sites. 15 km from Eyzies de Tayac, the world's capital of prehistory with its museum. And 2 km from the Parc de Jacquou with attractions and aquatic fun park. Not far away, you will find a golf course, a riding school and canoes for rent for your amusement.